Today I'd like to share Holiday shaker card with you. This is my first attempt to make non framed shaker card. Let's get started! I started by ink blending the white card stock for snowflake panel using dye inks. I used MFT Tickled Pink and Insulation Pink. 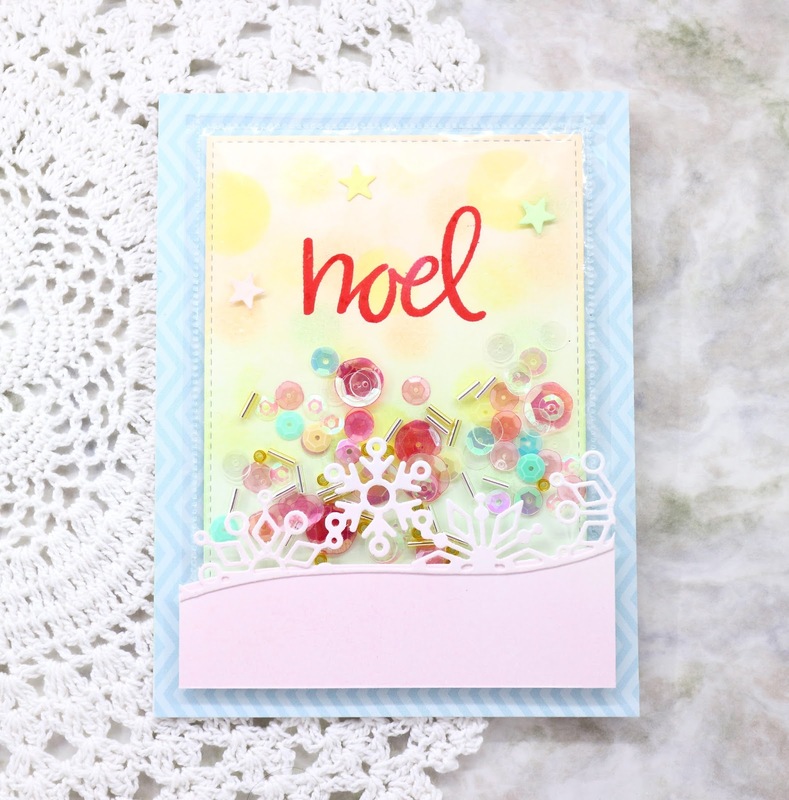 After ink blending, I die cut it using Simon says stamp Snowflake Border die. I then adhered snowflake to the bottom panel. Next, I die cut the rectangle from white card stock using MFT Stitched Rectangle die. I then ink blended it with dye inks. I used MFT Peach Bellini, Lemon Chiffon, Spearmint. With same inks, I created bokeh effect using mini dauber and circle stencil. I then stamped Noel sentiment from MFT Hand-lettered Christmas stamp set. I made shaker using We R memory keepers Fuse tool and acetate. Sequins are from my stash. I trimmed blue chevron paper from MFT Calm & Cozy Chevron paper pack and mounted it to the white card base with shaker and snowflake panel. 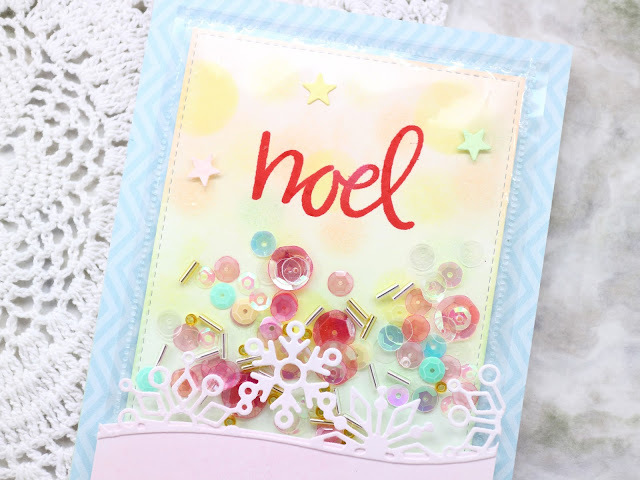 To finish off, I added some small stars die cut from MFT Tag builder Blueprints 6. Here are some close-up pics. Most of MFT supplies I used today are my prize from 2016 MFT Superstar contest. Heartfelt thanks again, MFT! 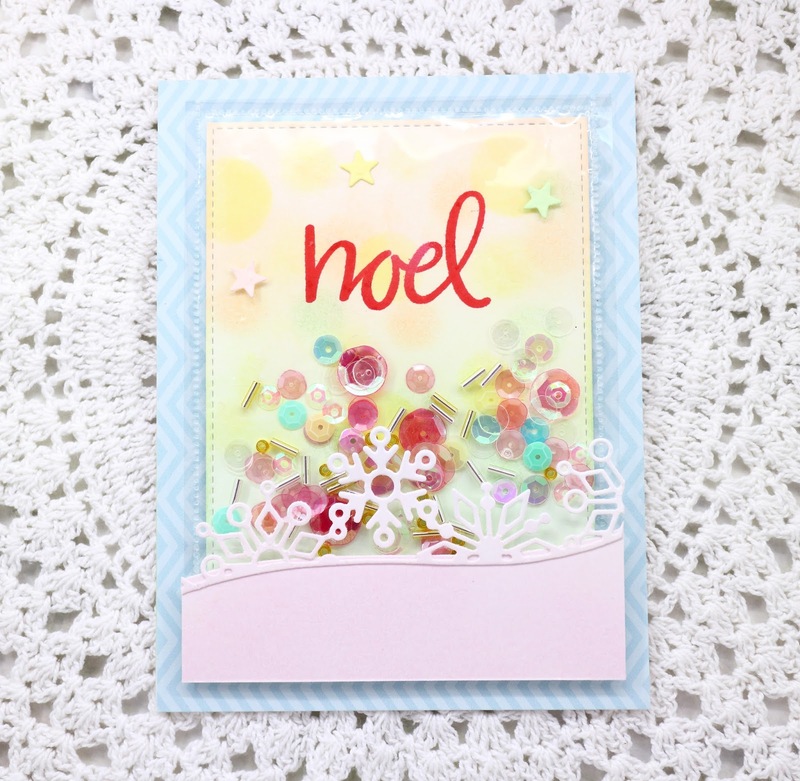 So pretty, love the colors Dana! Thank you as always, Amy!! Beautiful shaker card!! Such a fabulous design! Love the colors too! !